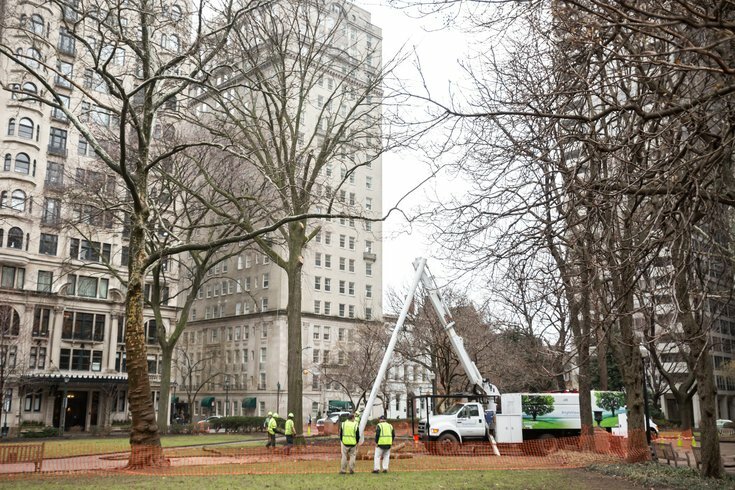 A large tree in Rittenhouse Square is removed due to safety concerns, Tuesday, Feb. 20, 2018. A large oak tree that stood for decades within Philadelphia's historic Rittenhouse Square was being removed Tuesday due to safety concerns. The tree rose at least 75 feet above the southwestern corner of the park, but it began dying several years ago. "That tree unfortunately has been on life support for the last couple of years," said Renee Dubyk, president of Friends of Rittenhouse Square, the nonprofit that oversees the park. "We're not really sure what happened. But we're thinking when the sidewalk was replaced a couple of years ago, they may have cut one of the main roots of that tree." The organization attempted to save the tree before deciding to remove it, Dubyk said. "We had been chatting with the city about whether it was time to take it down," Dubyk said. "We tried doing some air spading work to it. Ultimately, it didn't work." To address concerns about dead branches falling into the park below, a BrightView Landscaping crew began removing the tree on Tuesday morning. Dubyk did not know when the tree had been planted. The Friends of Rittenhouse Square had never conducted a formal tree assessment before the one they did a few years ago, she said. 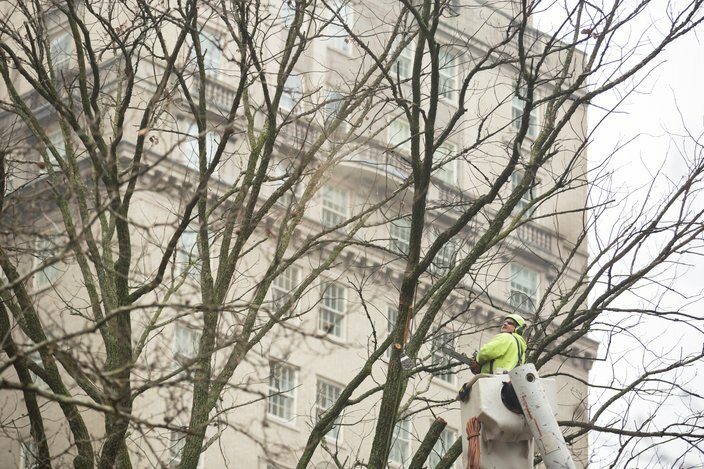 A BrightView Landscaping contractor removes the upper branches of a tree in Rittenhouse Square, Tuesday, Feb. 20, 2018. Rittenhouse Square has undergone several landscaping changes over its lifetime. But the last major overhaul came more than 100 years ago, when Paul Philippe Cret was tapped to redesign the park. By that time, about 100 trees stood dead or dying. Dozens of shrubs provided little beauty, nor did the trash pit in the southeastern corner. Cret redesigned the park so that diagonal crosswalks led to an oval terrace at the park's center, with walkways lined by trees. Since then, Rittenhouse Square mostly has remained unchanged.